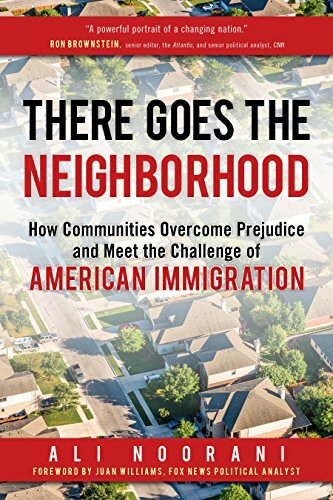 While the book’s title may be clever, the subtitle says it all: How Communities Overcome Prejudice and Meet the Challenge of American Immigration. Noorani is an expert in this topic, and it shows. Currently the executive director of the National Immigration Forum, he was previously at a similar position at the Massachusetts Immigrant and Refugee Advocacy Coalition. Noorani’s years of experience working in the often gnarly field of immigration reform has brought him to this book, and the information he shares can help every reader in his or her community. This book is not just for academics, but for every American worried about the state of our divisive politics today, pitting neighbor against neighbor and raising the specter of immigrants or refugees as enemies rather than friends. More than anything There Goes the Neighborhood highlights the people behind the political debates. Not only does it show the broad picture of the policies, but also in minute detail the faces of those who are affected on a daily basis by them. He searches into his arsenal of stories to bring us the everyday heroes of immigration reform, and the men and women—and children—who are impacted. Noorani allows us to meet the businessmen, clergy, and law enforcement officers who are fighting on both sides of the issue. Most importantly, he does not shy away from the ugliness of the debate. He shows readers what opponents of the immigration issue feel and believe, and attempts to explain what barriers our nation faces in the years ahead as immigration reform becomes an extremely hot-button topic dominating our political discourse. In this book, readers are exposed to the stories of business owners who debate the hiring of immigrants—legal or otherwise—and how it affects their bottom line. Readers are given an insight into the lives of farmers who hire migrant laborers, and how policy affects them intimately. There are stories of small towns struggling with growing immigrant populations, as well as stories of police officers who have spiritual awakenings and come to see the helping of refugees and immigrants as part of their religious duty. In short, There Goes the Neighborhood discusses history and legal issues, but woven between all those facts and statistics are rich stories that bring the data home to readers in a mind-blowing way. Noorani also offers a unique viewpoint in his role with various immigrant organizations to show both sides of the issue, and therefore offers important lessons. What he has learned along the way is important and often ignored in the debate: the role of faith organizations in resolving immigration. According to Noorani’s research, faith groups have a unique opportunity to change how people and communities view immigrants, and their services are typically well equipped to provide integration. He tells the stories of pastors who have been indelibly altered by visits to detention facilities, who have decided to lead the charge of convincing their congregations to help and support immigrants, refugees, and even the undocumented among them. For these pastors, Christ and the church calls them, and they must answer, regardless of the politics of their congregations. From Utah to Alabama to Texas and across the country, Noorani sketches the past, present, and possible future in terms of immigration. We are a nation of immigrants, and each generation of immigrants has witnessed the same fear, distrust, and anger leveled against them. There Goes the Neighborhood offers real solutions to the problems immigration poses and gives us facts to combat false narratives and hateful political discourse. A timely, important read for all readers interested in this debate.